How Will You Customize the Nissan Titan XD? 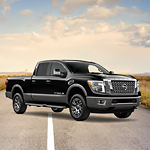 The 2019 Nissan Titan XD is a versatile pickup truck that could be customized by Lithia Nissan of Medford. You can several accessories that improve style, off-road performance and utility of this robust Japanese model. Having a patented design for optimum convenience, the Titan Boxes are integrated into the bed of this truck. These waterproof boxes can be used as coolers to keep your drinks and snacks at ideal temperatures for road trips. Additional storage panels are available near the tailgate and headers. You can lock the boxes with a mechanical key for extra security. Steps rails are available for the stylish 2019 Titan XD. Having a textured surface for good traction, these accessories provide extra leverage for climbing into the vehicle. Bed side steps can be installed to improve mobility into and out of the bed. When they're not needed, the adjustable side steps could be tucked under the bed.